FVCOM-SWAVE is an unstructured grid finite-volume version of the Simulating Wave Nearshore (SWAN) model, which was developed under the FVCOM framework [Qi et al., 2009]. SWAVE is numerically solved using a flux-corrected transport algorithm in frequency space, an implicit Crank-Nicolson solver in directional space, and FVCOM finite-volume solvers in geographic space. 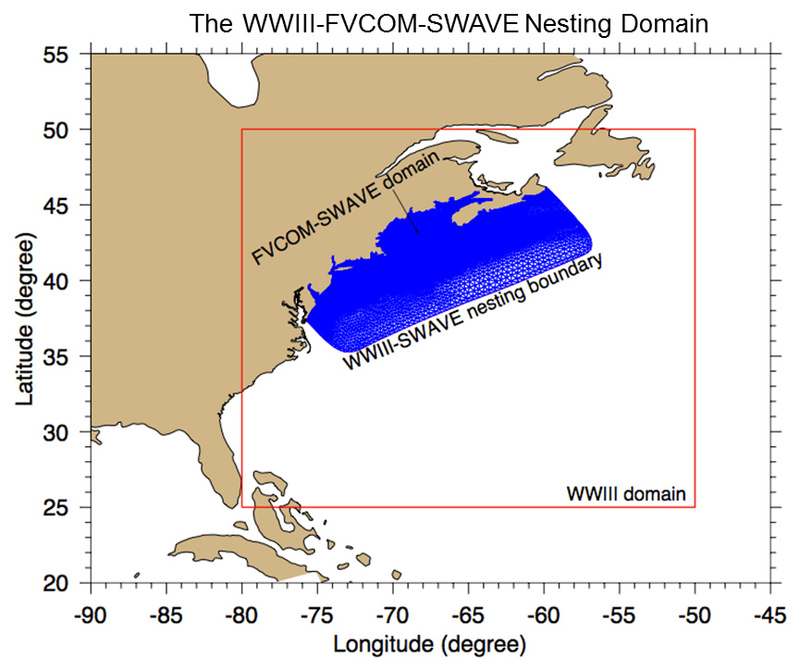 In NECOFS, SWAVE is configured as the same domain with GOM-FVCOM, with a horizontal resolution varying from 0.3 km in the coastal region to 15 km in the open ocean. A Wave Watch III (WWIII) is set up in the larger domain and run simultaneously with SWAVE and provides the boundary conditions to SWAVE through a “one-way interaction” nesting approach.